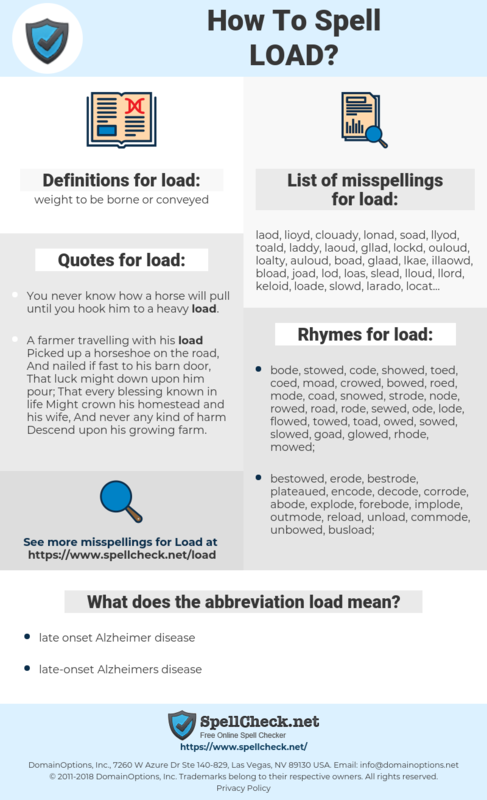 What are the misspellings for load? What are the common mistypes for load? What does the abbreviation load mean? What are the quotes for load? What are the rhymes for load? What are the translations for load? 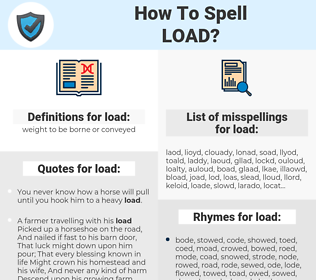 What are the common typos for load? This graph shows how "load" have occurred between 1800 and 2008 in a corpus of English books. In films, the fact that you can always do a scene again takes a load off your mind, enabling you to strive for perfection, which I always wanted. belasting, lading, vracht, opladen, vullen, belading, inladen, bevrachten. Beanspruchung, beanspruchen, Belastung, Ladung, aufladen, belasten, laden, beladen, beschicken, einlegen, Kraft, Charge, Belastbarkeit, Last, Auslastung, einladen, Traglast, befrachten, Fracht, Verbraucher, Verladen, Beladung, Ladegut, Auflast, Fuhre, Störsenke, bepacken. に, ロード, 荷重, 荷, 装填, 積み荷, 積荷, 重荷, 取り出しボタン, 乗せ込む, のせこむ, おもに, つみに, とりだしボタン, 載荷, 載せ込む. carga, cargar, fardo, cargamento, peso, montón, cargarse.